In some ways I think labeling this book as horror is misleading. I would call it a political thriller with a seriously scary zombie virus riding shotgun. Think State of Play or All The President’s Men in a world where Outbreak happened, but without the happy ending. Grant taps into our darkest fears of viral outbreaks and genetic engineering and lets them shamble forth in genre form, but more than anything this is a story about the politics of fear. Our leads, Georgia and Shaun Mason, are a brother and sister team of intrepid bloggers who get tapped to follow a Presidential hopeful on the campaign trail, and who quickly find themselves mired in a plot that is way out of their league. This book is smart. Smart in a way that is utterly refreshing to see associated with politics and politicking, and smart in its technical and biological underpinnings. In fact this story is terrifyingly detailed as to the ways a virus could destroy a society. The minutiae of infection, of decontamination procedures, of all the horrifying realities of a life lived under siege, are just exquisite and fascinating. I heard Mira Grant say at Comic-con that she spent a ridiculous amount of time on the phone with the CDC researching for this series, and it shows. It’s horrifying to think how close this premise is to a scenario that could actually happen in real life. Sidebar – if you don’t believe it could, check out The Dead Hand, a non-fiction tome by David E. Hoffman that documents the Cold War arms race. In the intro there’s a brief story about an anthrax breakout that occurred in the Ural mountains, because (they think) someone failed to properly replace a filter at a military microbiology facility. Anthrax spores were released into the air, and because the Soviet Union hushed it up so quickly they’re not sure exactly how many people died, but hundreds got sick. And that was before genetic engineering! FEED seamlessly meshes politics and zombies. I don’t want to give too much away about the plot, but there is a lot implied about the bigger picture that isn’t fleshed out (excuse the pun), and I hope we get deeper into those murky waters of conspiracy in the next installment. In this book, the reveal of the Big Bad felt somewhat inevitable to me – and I don’t know if it was a tad obvious, or if it was just my political preferences leaning me towards who I wanted the Big Bad to be, but you do have a sense of where its all heading. It’s the details, the investigation, and the ever present specter of disaster that make this story so riveting. Plus, the characters are just fun – Georgia and Shaun Mason have a sibling relationship that is authentic and irreverent, and I loved watching them work. Buffy, their tech savvy poetry writing sidekick, is also an amusing bundle of weird. The politician characters do lean a bit towards caricature, but then again, they do in real life too. Georgia and Shaun’s relationship is the meat of this book, and they’re worthy of it. I honestly was glued to FEED from beginning to end, and what an ending it is. Bold and gut wrenching – it hurt to read and I loved every page. You don’t have to be a horror fan to enjoy these zombies. From examining the political consequences of a world constantly under siege to detailing how blogging and Internet news feeds would develop in the face of the threat, Grant’s creativity and thoroughness give her narrative an unshakable credibility. Her cast is predictable, but her commitment to them, and to their environment, makes for an exciting read. 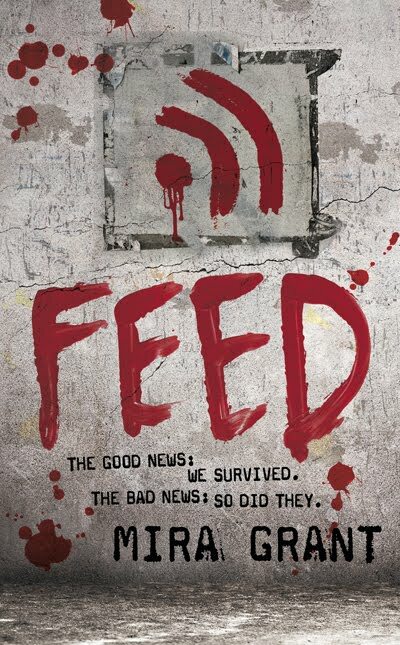 Like the most memorable works in the zombie canon, Feed uses its zombies (those reanimated corpses teeming with Kellis-Amberlee) to examine humanity. And this, dear readers, is really goddamn cool. Feed is one of the few book, as of late, which I have picked up and gotten truly excited about once I started reading it. Not only is it a story that is immersive and captivating, but it is written by an author that is not afraid to take risks to tell the story. I found myself thinking about the story during the day and once I got into the true meat of the story I was not able to put it down, finishing the last three hundred pages, half the book, in one night. I never pick up viral outbreak stories on my own, but this one was worth a read. I liked that it dealt with life a generation after an outbreak disaster instead of during the initial horror, which has been done over and over. The blog-centric world reminded me a bit of Scott Westerfeld’s Extras.